This post has been updated to reflect that sign-up for the limited adoption content pack preview is now closed. We’re currently targeting to release the final version of the content pack to all customersby the end of April. This post has been updated to reflect the availability of the adoption content pack preview. 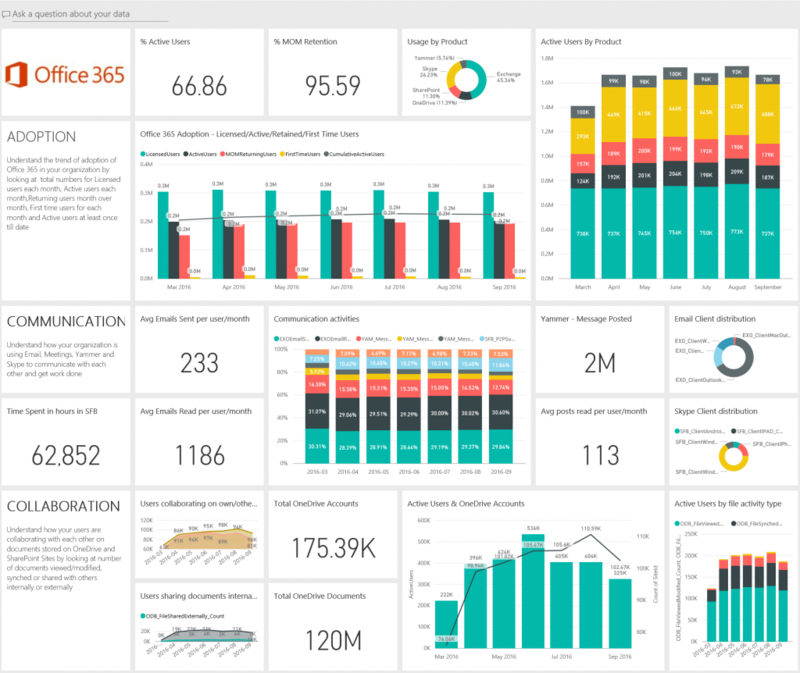 To provide you with richer and more personalized usage insights, we’re combining the intelligence of the usage reports with the interactive reporting capabilities of Power BI. The new Office 365 adoption content pack enables you to visualize and analyze Office 365 usage data, create custom reports and share the insights within your organization and pivot by attributes such as location and department. Today, we’re announcing that a limited preview of the adoption content pack is now available for Office 365 customers. Office 365 is all about enabling users to be more productive and to communicate and collaborate more effectively. With the adoption content pack, admins can gain deeper insights into how their users leverage Office 365 to communicate and collaborate and how it has evolved over time. This helps understand where admins need to focus user training and communication going forward. The dashboard is split up into four areas: Adoption, Communication, Collaboration and Activation. Admins can access detailed dashboards for each area by clicking any of the metrics. 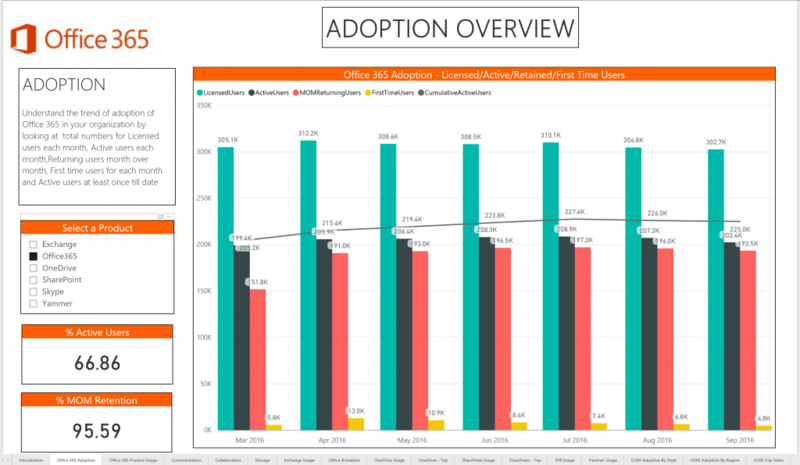 Adoption report—Helps you understand how your users have adopted Office 365 as well as how usage of the individual services has changed month-over-month. Admins can easily see how many users they have assigned a license to, how many users actively use the products and how many are first time users or returning users that use the product each month. This helps admins identify the products for which additional user training might be needed to increase adoption. Communication report—Shows admins how users use Office 365 to communicate. The dashboard includes a communication activities report that provides details about how the usage of different communication methods—such as email or Yammer message posts—has changed over time allowing admins to understand how their users adopt new ways of communication. Additional metrics include average number of emails sent, average number of Yammer posts read and average amount of time spent using Skype. The dashboard also shows which client apps are used to read email or to use Skype. Collaboration report—Gives you the ability to see how people in your organization use OneDrive and SharePoint to store documents and collaborate with each other and how this is changing. Admins can also see how many users share documents internally versus externally. 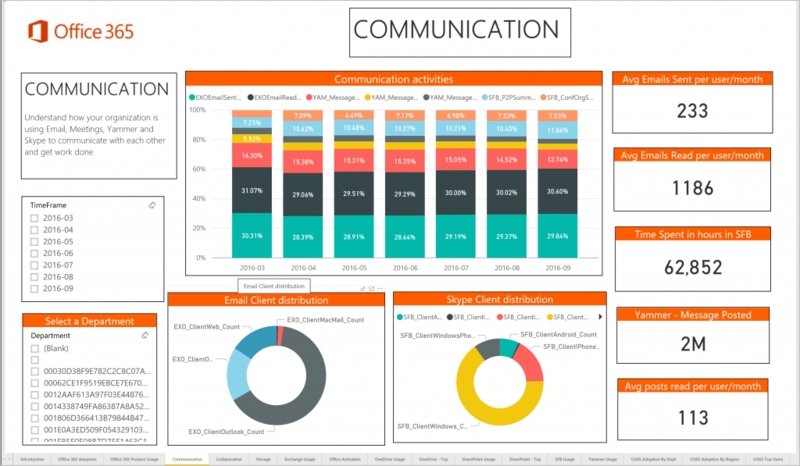 Activation report—Helps you understand Office 365 ProPlus, Project and Visio activations. Admins can see total activations across users, number of users that have activated the products, number of devices they have activated them on and the type of device. The dashboard is just a starting point to quickly get started with the adoption content pack and to interact with the data. As every organization has unique needs, we’ve ensured that admins can query the data to help you answer specific questions about your organization and create a personalized view. For example, you can filter to show only one of the products or adjust the time frame of the reports. By default, most reports provide data for the previous six months. Admins can also create additional reports or a new dashboard that show specific views. The adoption content pack also allows you to easily share the usage reports with anybody within your organization who might not have access to the Office 365 admin center. In addition, the adoption content pack combines usage data with the Active Directory (AD) information of your users and enables you to pivot by AD attributes such as location, department or organization. Please try the new features and provide feedback. And don’t be surprised if we respond to your feedback. We truly read every piece of feedback that we receive to make sure the Office 365 administration experience meets your needs.